Good traditional French food without being pompous! We enjoyed the special, beef with pureed carrots and it was excellent. The service was also the best. Very nice atmosphere. Many locals were dining here. Highly recommend. Second time in Paris second time at La Marriott... Atmosphere here is something to come back to every time...does not hurt that the food is amazing also???? Really enjoyed dinner here. Interesting menu, delicious food, excellent service in attractive atmosphere. La Fourchette sent me a confirmation of the booking for tonight's dinner at 20:00 (Aug 6) but when I arrived it was closed! Très très bon! Nos compliments! The reviews were nice, we ordered the menu du marché. It was really disappointing. Maybe next time we should order à la carte. Du vin en carafe, sans dessert, et l'addition était de 140 Euros ! Wonderful lunch with friends. Everything was super. We enjoyed a very tasty dinner, with 2 fish mains. Great atmosphere and very friendly and welcoming staff. The food is traditional and very well prepared. The wine list is well-chosen and they give good advice! We loved the food and the atmosphere. the service was excellent too. We will be back for sure. After over 60 visits to Paris I finally met him..the RUDE waiter. Oh so have been berrter than other and all that but never like this. I asked a question about the items on the blackboard as opposed to specials on paper in menu and was treated like a child or worse. The when I said I had another question I got a sarcastic "No?!" complete with facial expression. My question was about one of the items on blackboard which was in quotations, only item in quotations, with which I was not familiar "montauger" saucisson. I knew , of course it was a sausage just not which kind. He said what it was, then started painfully translating everything on blackboard. I was saying "I know" but he just kept on then proceeded to point to first item on my menu and continue. I finally said Stop! He then said I've give you 2 minutes and be back. I was already sipping champagne or would have woalked out but also was quite frankly shocked! When he returned he said." Oh you reserved with The Fork?" and improved. No great quibble with the food but expected a little more oomph from a Bib Gourmand restaurant. Sensible short wine list with good values. Very nice atmosphere with friendly staff who work well as a team. The food we had was simply prepared. Arrogant, rude service. Waited one hour for main courses....four tables that arrived after us were served first. No apology was offered. Food was disappointing. We have been coming to Marlotte for 21 years-through perhaps four different owners. 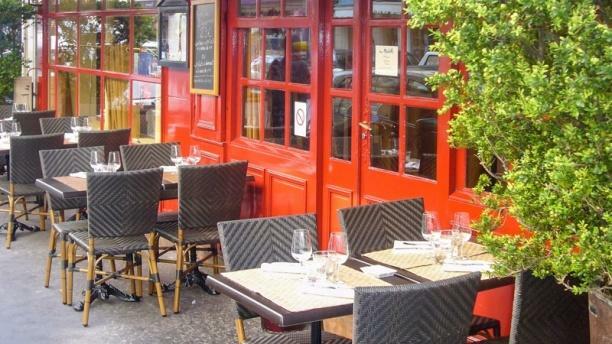 It is still a charming neighborhood bistro with a wide range of dishes all expertly prepared. On one of our favorite streets in Paris, it is a place we hope to enjoy for many more years.